In order for Malawi to achieve Millennium Development Goal 4, to reduce child mortality by two-thirds before 2015, this report addresses the issue of diarrheal disease by examining the current policy environment in Malawi. By using the UNICEF/WHO seven-point plan for diarrheal disease control as the guiding document, the group identified current strengths and weaknesses, and then collaborated to agree on a set of recommended steps to help re-prioritize diarrheal disease control. 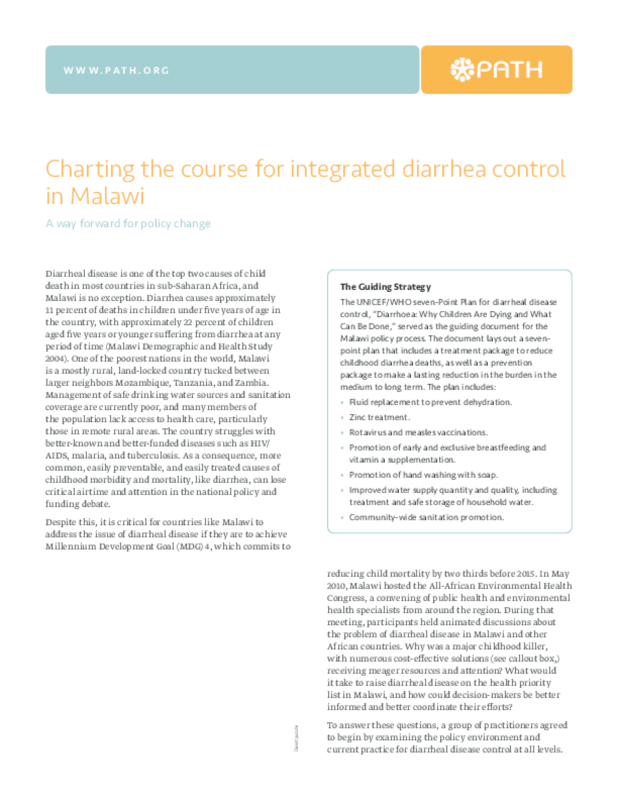 The recommendations emerging from this report describe a detailed path for a way forward towards ownership, accountability, and sustainability for diarrhea control efforts in Malawi. Copyright 2011 PATH. All rights reserved.